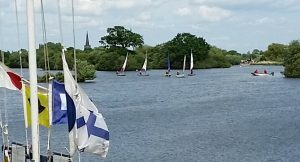 Cygnet Series 4th Race 3rd June 2017. Saturday’s race was a great success as it was the first race of the year that all starting racers actually finished. On the water Martin came first followed by: Jill, David, Iona, Rhys, Thomas and Lisa. The wind was good but the course was tricky, all racers suffered at different parts of the course, this made it a great and very challenging race. After the race Keith talked about going head into wind. After this we followed Keith in the safety boat to learn about reaches, runs and heading into the wind. Iona and Martin were in the Feva to help them work towards their Stage 4 sailing certificate. We then played dodge ball with Jill helping Lisa and then taking Emma in the Feva. The results are very close this year with only a few points separating the top 4 races.